One of the key features on the new Porsche 911 is its wider, variably extending rear spoiler from Rehau AG + Co. The spoiler was designed to reduced front and rear lift, which improves aerodynamics and lowers fuel consumption. Rehau also supplies the grille, air duct and water tank components on the seventh-generation of the sports car. Porsche constructed the new 911's body from a lightweight aluminum-steel composite, which reduced weight by 45kg compared with the previous-generation 911. Continuing on the theme of improved driving dynamics and efficiency, the new 911 has an innovative new electro-mechanical power steering system supplied by ZF Lenksysteme GmbH. The new system, known at the supplier as ZF Servolectric, uses an electronically controlled electric motor to replace the conventional hydraulic system. Among the major benefits of using this type of system are significantly reduced power consumption and a substantial weight reduction resulting from the removal of several major components. These include the steering valve, steering pump, oil reservoir and high-pressure hoses. 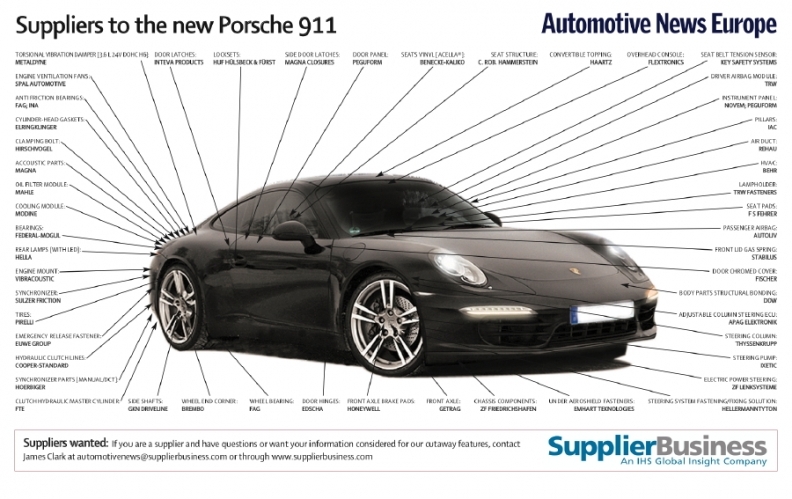 Porsche launched the new 911 at the 2011 Frankfurt auto show in September. Produced on the 9X1 platform in Zuffenhausen, near Stuttgart, peak output is expected to reach 33,208 in 2013, according to IHS Automotive forecasts.